Martabak Manis (Indonesian sweet thick pancake) is one of popular snack in Indonesia. 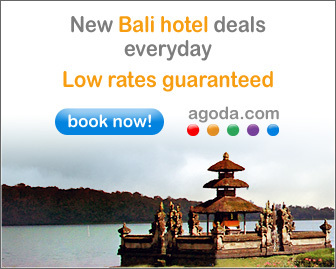 It is also known as ‘Terang Bulan’ (means ‘shinning moon’ in English) in Surabaya (East Java) or ‘Martabak Bangka’ in Bandung (West Java). You can easily find it along the streets in almost big cities in Indonesia as common street food that usually sold by street vendors in the evening. 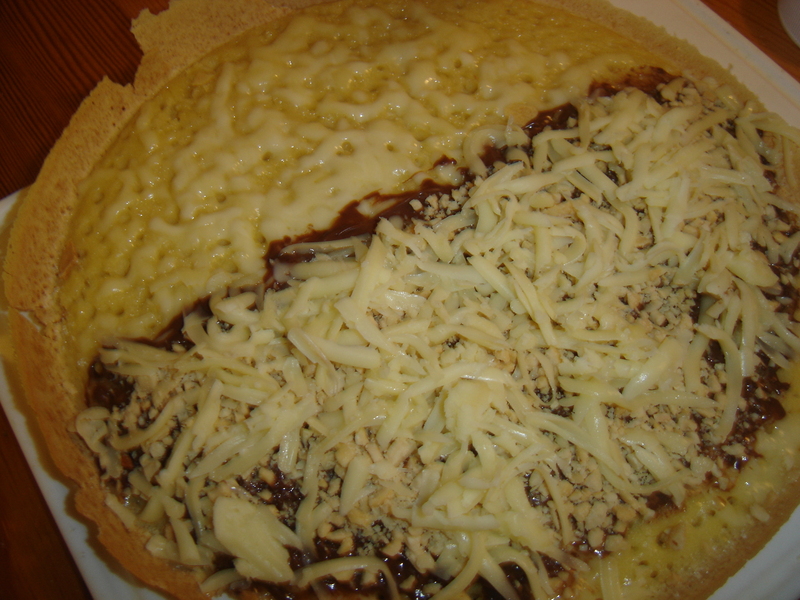 There are 2 versions of martabak in Indonesia : sweet and a savoury one with meat and egg. I like both and they usually sell it in same street vendor. Now, since I live abroad, sometimes I miss all the delicious street snacks which I couldn’t find it here. The only way to fulfil my wish is by making it by myself. Martabak manis or Terang bulan is one of my favourites. I wonder how to make it because the street vendor use special martabak pan made from thick steel. I browsed how to make with just cast iron pan or a non-stick Teflon. 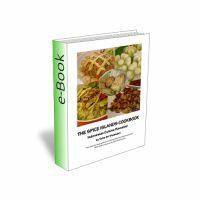 And I found many recipes and have tried them … few times I failed! It didn’t taste or feel right! Well basically martabak manis has similarities with pancake; made from flour, eggs, butter, baking soda, milk and yeast. 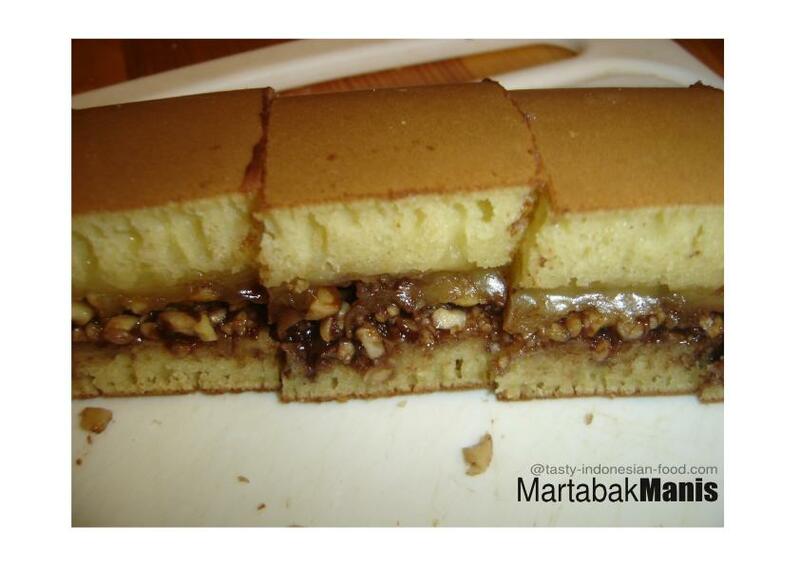 The difference is, martabak manis is thicker, larger in size and has different kind of texture and filling. 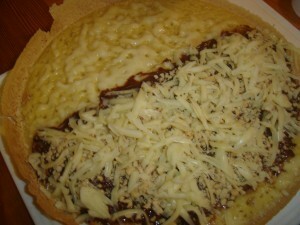 The common filling is a combination of custer sugar, chocolate sprinkles, some cheese (they usually using Kraft cheese), white condensed milk and ground peanuts. So yes, it is really SWEET!! And the texture of a right Martabak manis has to be soft & chewy with its distinct honeycomb texture visible. Finally after tried different recipes … I found a perfect one, just the way I like it. With a little bit of adjustment – the taste turned out right, also the final texture. 1. Combine flour with yeast and salt. Then using electric mixer, whisk eggs, sugar and milk on high speed. Then slowly add flour mixture into the batter and whisk until there’s no lump. 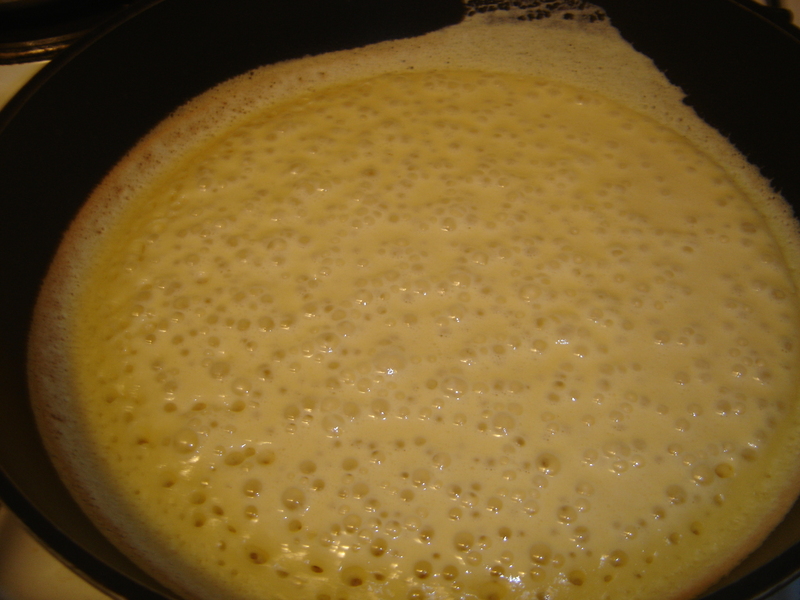 Cover the bowl with towel and let it rest for about 30 – 1 hour until the batter raise up and create small bubbles. If the batter is too thick, you can add cold water a bit and mix well. 2. Add the baking soda into the batter, wait for 5 minutes then heat 24 cm flat thick bottom flat cast iron over medium heat. Using ladle, take about 3-4 scoops the batter into the pan so it covers the base completely. Press the batter with ladle backside around the pan edges to create crispy edges later on. Reduce the heat to low, cook until it creates plenty of bubbles on the surface. Sprinkle some sugar around the pancake, then put on the pan lid. Leave it cook for another 10-15 minutes. 3. Transfer the pancake to a flat surface and spread some butter on it. Then fill the pancake with the prepared fillings. 4. Flip the pancake over one side to cover the other side then using knife cut it as you desired . 1. Use a good (new and fresh) yeast so that it will create a good batter. 2. I am using a thick non-stick pan so that I don’t need to use any butter. Based on my experience if I put butter, it doesn’t create a very good honeycomb texture.